We had only one small informal dinner for close friends before our annual staff party and Christmas Eve meal this year. That is extremely unusual as we normally have 3-4 dinners at this time of year, but it just didn’t seem like the year to do that… and many of our would be guests have opted to head abroad or to the provinces for Christmas this year. So it was a decidedly quiet and calm run-up to Christmas Eve. 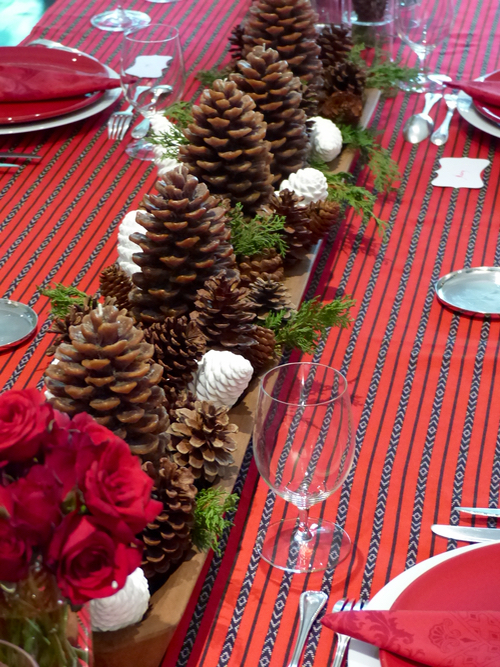 The decor for this tablescape included some real pine cones from Baguio and the surrounding mountains, some unglazed bone china pinecones made in Laguna, some pine cone candles purchased at deep discount from Crate & Barrel, and some sprigs of pine. 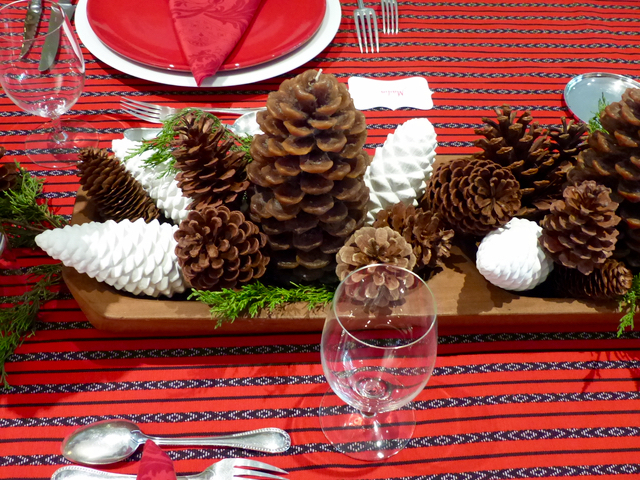 I placed the pine cones at different heights and used various sizes of pine cones as well. Large and small pine cone candles seemed to blend in perfectly, some guests without they glasses thinking they were actual pine cones! 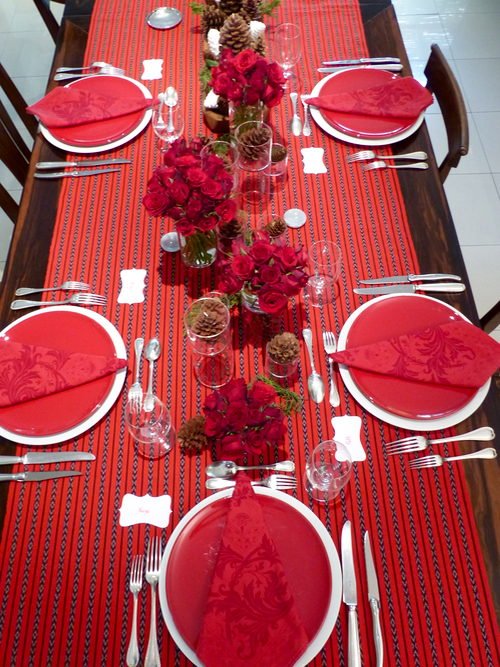 Everything rests on a woven table runner from the Mountain Province. It looks festive yet environmentally friendly and local at the same time. 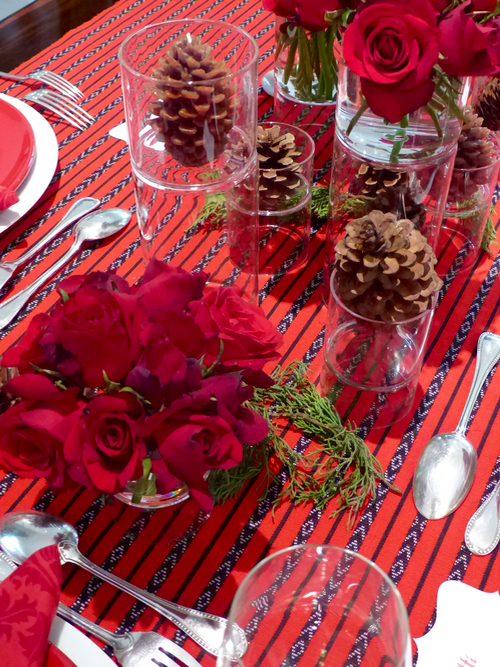 The tablescape is meant to last at least two weeks, and for this one dinner with friends, we added some red roses to some of the vases to brighten it all up. On days without flowers, we have candy canes or foil wrapped chocolates to keep with a holiday vibe. The large cone candles in the 4th photo look as if they are pine trees in a forest. 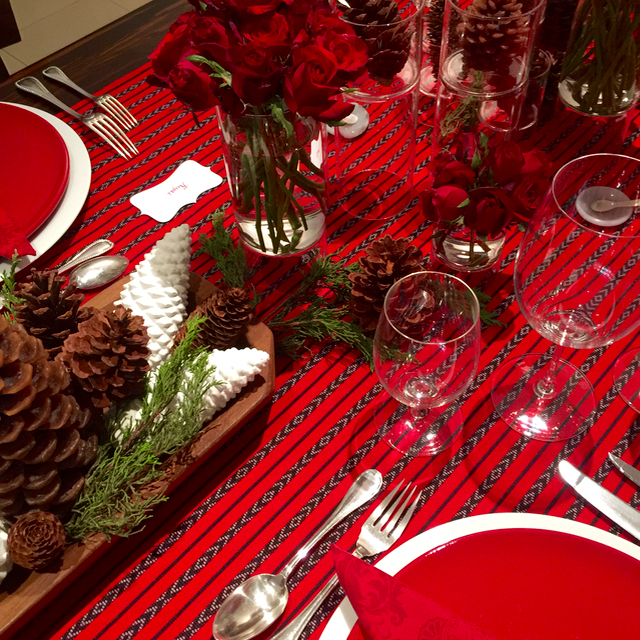 Such a beautiful table setting, so festive! Toned down but as beautiful as ever! Now, this is simple yet classy!